Subject: LongIsland.com - Your Name sent you Event details of "Man of La Mancha presented by Hampton Theatre Company"
“Man of La Mancha,” the first fully-staged musical in the 34-year history of the Hampton Theatre Company, will be the third play of the HTC’s 2018-2019 season, opening on March 21 at the Quogue Community Hall and running through April 7. Framed as a play within a play, “Man of La Mancha” presents Spanish writer Miguel de Cervantes performing a play based on his novel “Don Quixote” to a group of prisoners awaiting a hearing. Its score includes the standard “The Impossible Dream," as well as "Man of La Mancha (I, Don Quixote)" and "A Little Gossip," to name only a few. Major Broadway revivals of the show were staged in 1972, 1977, 1992, and in 2002, with Brian Stokes Mitchell in the role of Cervantes/Quixote. In addition to productions in London’s West End, the musical has played in many other countries around the world, with productions in Dutch, French (translation by Jacques Brel), German, Hebrew, Irish, Japanese, Korean, Bengali, Gujarati, Uzbek, Bulgarian, Hungarian, Serbian, Slovenian, Swahili, Finnish, Ukrainian and nine distinctly different dialects of the Spanish language. Dale Wasserman (1914-2008) wrote for theater, television and film for more than 50 years. Perhaps best known for the musical “Man of La Mancha,” based on his original teleplay, “I, Don Quixote,” he also wrote the stage play “One Flew Over the Cuckoo’s Nest,” based on Ken Kesey’s novel. Both shows continue to be produced nationally and internationally with an estimated 300 productions a year. The Hampton Theatre Company mounted a production of “One Flew Over the Cuckoo’s Nest” in 2010. The cast of “Man of La Mancha” features two HTC veterans: Matthew Conlon in the role of Cervantes/Quixote; James M. Lotito Jr. as Carrasco; and Jessica Howard doubling as the Housekeeper and the Innkeeper’s Wife. Playing Sancho, Rick Grossman is making his debut on the Quogue stage reprising the role he played in the recent Broadway national tour of “Man of La Mancha.” Other actors taking their first roles with the Hampton Theatre Company are: Anthony Arpino (Innkeeper); Kyle Breitenbach (Muleteer); Andrew Gasparini (Barber/Muleteer); Michael Sean Jones (Muleteer); Joe Mankowski (Padre); Alyssa Marino (Fermina); Nora Moutrane (Antonia); and Elora Von Rosch (Aldonza). Hampton Theatre Company Vice President Edward A. Brennan and HTC Artistic Director Diana Marbury are the directors. Musical direction is by Amy Federico McGrath. Set design is by Sean Marbury; lighting design by Sebastian Paczynski; costumes by Teresa Lebrun. 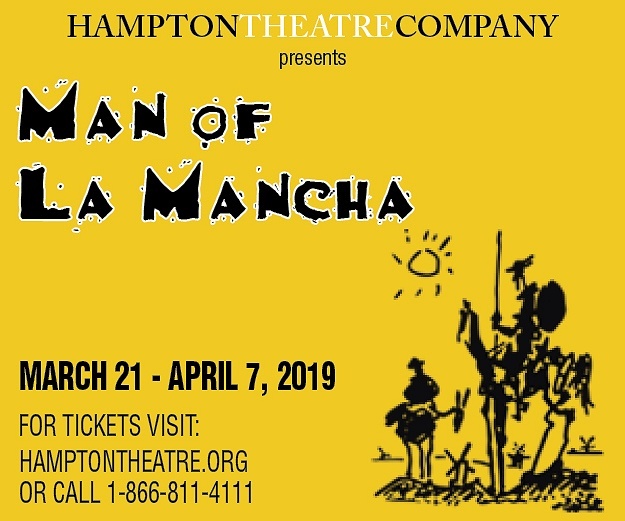 “Man of La Mancha" runs at the Quogue Community Hall from March 21 to April 7, with shows on Thursdays and Fridays at 7, Saturdays at 8 and Sundays at 2:30. An additional matinee performance will be offered during the final weekend of the production, on Saturday, April 6, prior to the regular 8 p.m. performance that evening. The Hampton Theatre Company will again be offering special dinner and theater packages in collaboration with the Westhampton, Southampton, Hampton Bays and Quogue libraries. Offered in association with the Quogue Club at the Hallock House, a special lunch and theater package is available for the Saturday matinee on January 26. For information about all packages and available discounts, visit www.hamptontheatre.org or email info@hamptontheatre.org. Additional information about library dinner and theater packages is also available through the libraries.